The origin of the word "universe" is in the ancient Latin phrase universum meaning, "the whole world". Today we know that there is much more to the universe than our own world. For example, there are also other worlds, stars, galaxies and possibly even other universes filled with even more stars and galaxies. This means that the commonly held notion that there is only one universe is only one interpretation among several contexts. The first, and most common context is the astronomical context. It identifies the universe as the full set of all matter and energy in our spacetime. The image ( left ) depicts the cosmic background radiation of our spacetime. Every objectively real thing that we know exists is located someplace within the colored egg shaped area. Then there is the cosmological context which may include multiple universes beyond the range of astronomical observation. Thirdly, there is the philosophical context in which the universe is the sum total of everything that exists. Lastly, there is the theological context based on the dogma and mythology of the host religion. Within each of these four main contexts are a variety of models, some of which have evolved significantly over the course of time. One of the main causes of confusion when those exploring this topic is that within each context, there is debate between researchers as to what the proper definitions are. The largest debates are among theologians, but even scientists are not unanimous with respect to some issues. Complete documentation of all these factors and their relationship to one another is beyond the scope of this article. However by thinking of the four main contexts as compass points on a map of the subject matter, one can fix a position within discourse, contribute relevant commentary and plot a direction for further inquiry. The word astronomy comes from the Greek words astron ( star ) + nomia ( law ) and therefore can be loosely thought of as the laws of the stars. This is in keeping with the standard container and contents model where matter and energy are the contents, and spacetime is the container. Astronomers generally ( but not always ) presuppose that spacetime must have existed in some limited volume sufficient enough to contain the initial state of the universe prior to what they call the The Big Bang, which is when the universe began expanding, its outer edges constantly at the boundary between the presence of matter and/or energy and of spacetime itself. For the astronomer, this boundary is where the universe ends. Therefore in the astronomical context, the universe is confined to all that would be possible to observe or measure. However some astronomers don't even go that far, confining their universe to what could hypothetically be observed from their particular location in space. Astronomers often refer to this as the "observable universe". So contrary to popular belief, the astronomer's universe has boundaries and as a consequence is not infinite. 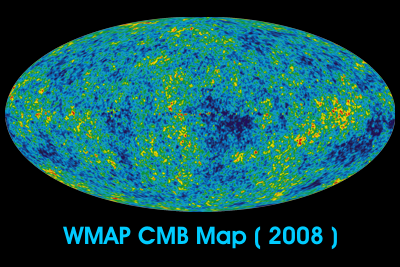 The WMAP CMB Map at the top of this page shows an energy pattern thought to have been generated by the Big Bang, and consequently almost as old as the universe itself. The colors represent tiny temperature fluctuations. Red regions are warmer and blue regions are colder by about 0.0002 degrees. It was created using data from the Wilkinson Microwave Anisotropy Probe, a super sensitive microwave detecting satellite positioned 1,094,304 kilometers beyond the Moon at Lagrange Point Two. Although the observable universe may be of finite size, it is currently a volume of great immensity compared with our own planet, solar system or even our entire galaxy. At the time this article was last edited ( 2009 ), the observable universe was estimated to be about 13.7 billion years old, and the most distant objects observed were estimated to be 46.5 billion light years away. A point of contention among astronomers and cosmologists is whether or not the Big Bang generated space and time concurrently with matter and energy, or whether spacetime existed prior to the introduction of matter and energy. At the time this article was written there was no conclusive evidence for either hypothesis. Logically however, because time as we understand it is entirely dependent on detectable changes in matter or energy, without it, time within an empty spacetime continuum cannot exist. Hypothetically however, it could be expressed in a relative manner to things happening outside the continuum. Therefore, prior to the introduction of matter and energy into spacetime, time must be either a purely mental construct for the sake of illustration after the fact, or that it manifested itself by changes taking place outside the boundaries of our spacetime. The origin of the word cosmology is derived from a combination of the ancient Greek kosmos (order, world, universe, ornament ) and ology (derived from logios + logos, meaning words, reasoning and discourse). In modern English the suffix ology denotes a given field of study, usually scientific as in geology or biology, or more generally as something studious like astrology or theology. Therefore, within the context of this outline, cosmology can be thought of as the scientific study of the universe as a whole. Cosmology can refer to either philosophical or astronomical lines of inquiry. While both have an influence on each other, this outline approaches cosmology from an astronomical perspective that is separate from mainstream astronomy. Cosmology is separate from mainstream astronomy in that mainstream astronomers are primarily concerned with the observable matter and energy in our spacetime continuum, while cosmologists focus on the nature of spacetime itself and the possibility of other continuums outside the realm of astronomical observation. Therefore when one speaks of the universe in the cosmological context, they are referring to the physical universe on its grandest scale. Cosmologists sometimes refer to this as the multiverse. As scientific observations on macro and micro scales probe the limits of our spacetime continuum, we move closer to learning the true nature of the universe we live in. At the time this entry was written, the technology to detect, map and physically explore beyond this spacetime continuum was in its infancy, consisting largely of deep space telescopes, space probes, particle accelerators, light emitters and light detectors. Major advances in cosmology are anticipated during the 21st century when these technologies are further refined and the data is studied. The philosophical approach to exploring the nature of the universe is called Metaphysics, and it is broader than both the astronomical context and the cosmological context. Metaphysics employs abstract thinking to focus on the nature of existence, time, space, causality and the underlying principles and theories that give rise to concepts of reality and the universe as a whole. Therefore it may also include elements of psychology, theology, quantum physics and any other topic relevant to the advancement of metaphysical knowledge. A recent addition to the list of contributing topics is Computer Science and Information Theory, wherein the nature of existence is explored using the concept of virtual reality. An excellent portrayal of this concept is the fictional motion picture series The Matrix, in which the universe appears to be material and real, but is actually a powerful computer simulation projected directly into the minds of the characters. A prominent earmark of Metaphysics is the absence of hardware and experimental equipment. Most metaphysical analysis is done on a purely mental basis or in conjunction with data secured by other disciplines. For example, as far back as the fifth century BC, the philosopher Leucippus proposed that the material universe is composed of very small discrete units called atoms, but it wasn't until over 2400 years later in 1955 AD that the first images of atoms were possible. For purposes of this outline, the theological context is the study of various religious interpretations of the universe, particularly those involving creation mythology. In such mythology the universe is something made by a divine being usually referred to as God. Theology doesn't usually attempt to explain how God's original universe came into being. The common answer is that God's original universe was simply always there and that it never had a beginning or a creation. Unfortunately that is like trying to convince us that the world is flat because it has always been flat and therefore no further explanation is required. The last refuge of the theologian is the faith argument which usually goes something like, "It's not for us to understand these things because they are beyond our understanding and only God has the answer". Although this is an honest confession of ignorance, it also breeds further ignorance by placing such inquiries in the domain of the divine and as a consequence out of bounds for secular inquiry. Because of this attitude, brilliant minds like those of Leonardo da Vinci and Galileo Galilei were once forced into religious submission despite the truths they illuminated. Fortunately, civilized nations have stopped punishing citizens for heresy. But there remains a vocal religious minority with political influence who continually discourage scientific progress on the grounds that, "we shouldn't be playing God". It doesn't seem to matter to them that God himself made mistakes. Despite these shortcomings, theology remains valuable in that it inspires people to consider the larger issues. Therefore positive contributions from theology are possible under the right conditions.